While both sides are preparing for next Gaza war, estimated start in one year or even this coming Summer, there is slight chance that Hamas and Israel can broke a deal as the war would not benefit either side. If so the outcome might be a longer calm period or even a Gaza state, while Fatah led Palestinian authority on West Bank will stay as bystander or try to build its own state with their unitary actions. It was reported in The Times of Israel that Hamas offers long-term calm in exchange for end of blockade. Senior Hamas officials met with Western diplomats about the ceasefire, and also reached a number of understandings about the character of the ceasefire. During the talks, Hamas officials emphasized that they were willing to agree on a ceasefire of at least five years (though some sources said the offer was for 15 years), during which time all military activities “above and below ground” from both parties would end. At the same time, the blockade on Gaza would be removed, including restrictions on exports, and Israel would allow the construction of a seaport and an airport. An Israeli official confirmed that the offer was presented to Israeli officials. 1) All forms of military conflict between Israel and the Palestinians will cease. 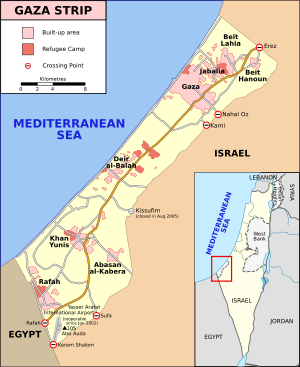 2) Israel will commit to removing the blockade on Gaza, including: opening all crossings around Gaza; permitting unfettered import and export from Gaza; allowing the construction of a sea and airport. 3) The tahdiyya [ceasefire, AR] will last between three and five years starting from the moment the agreement is signed, but the two sides will finalize the exact length of the ceasefire. Earlier there was unconfirmed rumour that three months before the elections, Israel received a concrete and detailed proposal from Hamas for an agreement on a calm period of five to 10 years. The official Israel did not respond but both sides’ interests dictate cooperation without formal decisions in the government. And now this cooperation is changing Israel’s strategy towards Hamas and same time bypassing the Palestinian Authority. 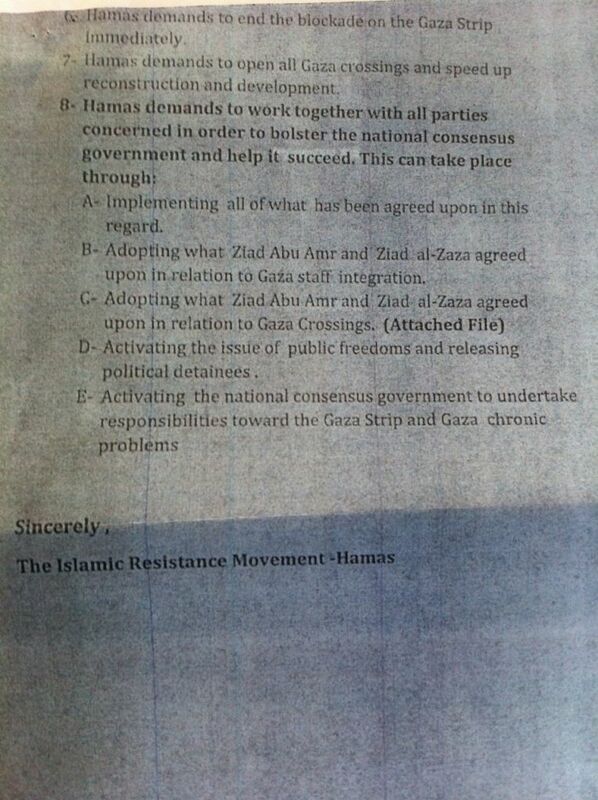 According Jerusalem Post Hamas is negotiating with Israel on Palestinian state in Gaza. The Palestinian officials have claimed that Hamas was negotiating with Israel about its plan to turn the Gaza Strip into a separate Palestinian entity. Mahmoud Habbash, the chief Palestinian Authority religious judge, who also serves as PA President Mahmoud Abbas’ advisor on religious affairs, said that Hamas’ “plan” to create a separate entity in the Gaza Strip was a “dangerous Israeli conspiracy.” Habbash claimed that the Israeli “conspiracy” envisages the total separation of the Gaza Strip from the West Bank. “Israel wants to divide the Palestinian people and turn the Palestinian territories into separate entities and cantons,” he said. Kayed al-Ghul, a senior official with the Popular Front for the Liberation of Palestine (PFLP), said that the idea of establishing a Palestinian state only in the Gaza Strip was first raised by late Prime Minister Yitzhak Rabin in 1988. Al-Ghul warned that the “plan” would have serious repercussions for the Palestinians. Ahmed Majdalani of the Popular Struggle Front, another PLO faction, accused Hamas of working toward establishing an “Islamic emirate” in the Gaza Strip. “There will be no Palestinian state without the Gaza Strip,” he said. He claimed that the late Prime Minister Ariel Sharon proposed the idea about 10 years ago, when he decided to withdraw from the Gaza Strip. Despite dialogue both sides are preparing themselves for the next war. Hamas is intensively rebuilding its terror tunnel infrastructure, that were used to attack Israelis during previous war, with the digging reportedly taking place six days a week with three shifts each day. 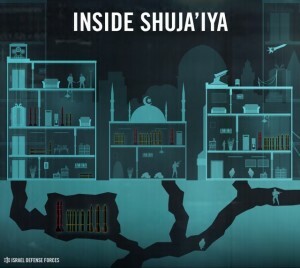 Over 1,000 diggers are said to be employed by Hamas to construct the tunnels, and the current estimation is that the tunnels lead up to Israeli territory – Hamas will extend them beyond when it feels the time is right to strike. A Hamas State of Palestine in Gaza? Hamas is consolidating its grip over the Gaza Strip and making plans to turn it into a separate state. Palestinian Authority leader Mahmoud Abbas and Fatah consider the purported plan a “severe blow” to the two-state solution and unity among Palestinians. As the U.S. Administration and the international community continue to push for a two-state solution between Israel and the Palestinians, Hamas seems to be working toward establishing an independent state of its own in the Gaza Strip. In recent weeks, reports have surfaced in a number of Arab and Western media outlets to the effect that Hamas leaders have decided to establish a “higher committee” for managing the affairs of the Gaza Strip. During last year there has been talks about national reconciliation between Hamas and Fatah. The Hamas-Israel dialogue is the last example that instead unity the split between Hamas and Fatah as well between the West Bank and Gaza Strip is even wider than before. It might be that the international community must define their two-state solution with new content including two Palestinian state – one Islamist emirate in the Gaza Strip and an other Fatah-controlled state in the West Bank. Related to possible deal between Hamas and Israel there is a risk that internal disagreements between Hamas’ political and military wings could endanger it. The rift within Hamas is widening amid disagreement over several issue: First the organization’s position on the recent turmoil in the Arab world, specifically over its stance on a Saudi-led coalition against Yemen’s Huthi group and second Hamas’ policy in Gaza concerning the confrontation with Israel and the deterioration of ties with Egypt. Ezzedeen Al-Qassam Brigades might take advantage of this instability within the organization to carry out attacks on the border with Israel without getting a green light from Hamas’ political leaders. This entry was posted on Thursday, April 30th, 2015 at 9:43 pm and is filed under BalkanBlog, Conflicts, MENA, Middle-East. You can follow any responses to this entry through the RSS 2.0 feed. Both comments and pings are currently closed.